I wanted to repurchase my Dr PawPaw soothing balm and was going to buy it from Boots (although now I'm not sure Boots actually stock it?) then I remembered I'd spotted that it was available in the Love me Beauty boutique. I'd also noticed there were several 50% off discount codes floating around for Love me Beauty, so instead of spending £7 just on the Dr PawPaw balm I thought I might as well spend a couple of pounds extra and get a few more products to try. 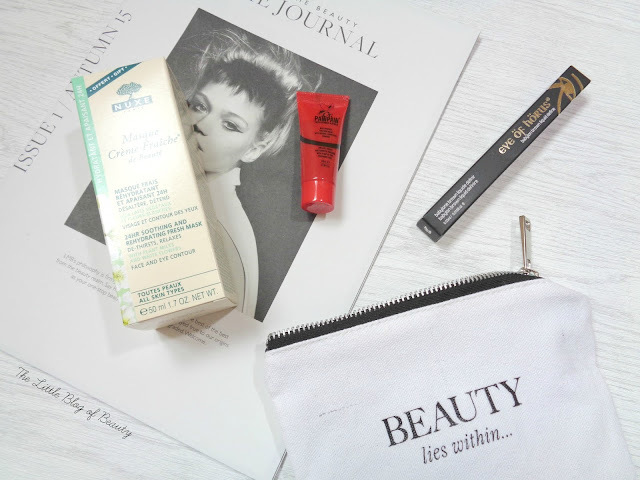 If you've not come across Love me Beauty before it's a monthly beauty subscription box with a bit of a twist. Each month you're allocated 60 credits that you can spend in the boutique. The boutique contains a selection of products (and now also jewellery) each worth either 10 or 20 credits. Instead of Love me Beauty deciding what products you receive you head to the boutique and decide how to spend your 60 credits. If you want more products then you have credits for you also have the option of buying further credits so you can add further products to your box. The products don't just change monthly either, they're constantly being updated as products go out of stock and new ones are added. The box itself costs £10 and then postage is £3.95, so my box cost £8.95 altogether after applying the discount code. Having never tried Love me Beauty before I haven't seen their box and when I opened my package when it arrived I was very impressed. The box is understated but really nice, featuring a grey/silver textured almost fabric like box with Love me Beauty embossed on the top in rose gold/copper. I thought the products inside came in a drawer string bag but I didn't get one, maybe because I didn't pay full price. As you're aware the first product I chose was the Dr PawPaw Tinted balm (10 credits). What I didn't realise was that this is not the full size product but the same size as the previous sample I had, so I didn't quite get the bargain I thought I had ordering the box (I don't mind this though). The balm I've just recently finished was the clear original but this time I decided I wanted to try the red one out, which is a good job as it was the only one available in the boutique. The second item I chose was the Beauty lies within make-up bag (20 credits). As I spend half my life living out of a suitcase at my boyfriends house little make-up bags like this come in useful for keeping together things like the lipsticks I've chosen to take with me. It's not the most amazing quality, especially as one of the teeth in the zip is loose so it doesn't actually zip up all the way across, but it's a nice little make-up bag (and very Instagram worthy!). Since managing to master the art of liquid liner application I've had an itch to try various different felt tip pen style liners and various different colours. 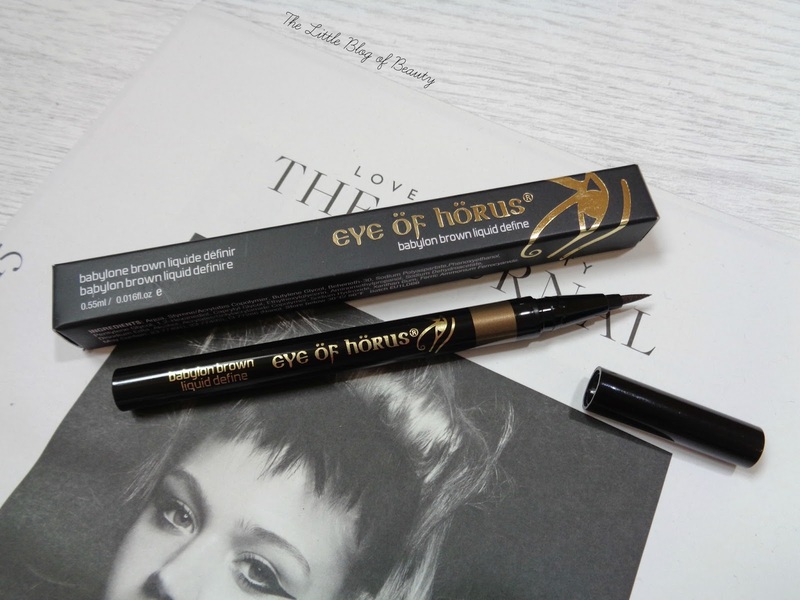 Although I couldn't find any good indication online of what colour Babylon brown is I thought well it's not black and decided to go for the Eye öf Hörus Liquid Define liner (20 credits). I was slightly disappointed to discover it's quite dark, so not a whole lot lighter than black, but from a quick swatch on my hand it looks promising, at least for a nice thin line if that's what you like. Finally I decided on the Nuxe Crème Fraiche de Beauté (10 credits) which is a moisturising mask. Although I do have several hydrating masks I have been curious to try this one and it was the only other product in the boutique at that time that I was really interested in. I'm impressed with the Love me Beauty concept and it's definitely a box I would consider ordering again in the future if there were products in the boutique I was interested in. The only thing that does put me off slightly is the £3.95 postage as I do think this is a little expensive. I was also slightly annoyed that I couldn't find out how much postage was anywhere on the website and only found out how much it is when I got to the checkout. Have you tried Love me Beauty or would you consider giving it a try? Eye of Horus is such a great brand! I know it's not to do with the post but I just had to leave you a comment to say your blog design is GORGEOUS! Who made it?